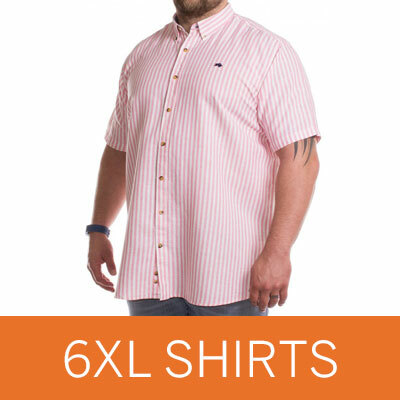 The range of men’s 6XL clothing is constantly being updated with new items and pieces perfect for everyday wear. Whether you are looking for a new pair of jeans, a new shirt for work or are looking for a new holiday wardrobe, Big Dude stock a great range of XXXXXXL items from loads of well-known brands including Duke, Farah and our own brand Big Dude itself. Our range of 6XL shirts are available in many different styles, perfect for a range of occasions from formal events or everyday wear. We stock many casual shirts in both long and short sleeves from popular brands like Duke Clothing, KAM Jeans and modern brand, Metaphor. For those special occasions, check out our range of formal shirts from Double Two and long-time favourite, Rael Brook. With varied collar types such as winged and classic along with many different colour styles such as plain, striped and checked, we offer a wide selection of 6XL shirts that will not disappoint. 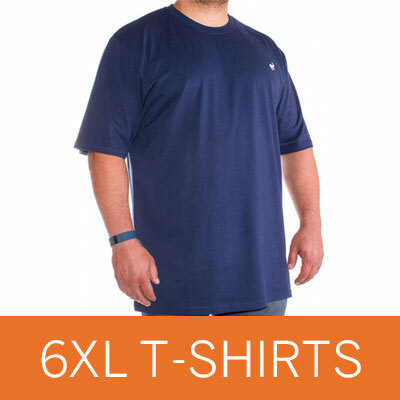 A great looking and stylish T-shirt can be tricky to find online in size 6XL, but at Big Dude, we strive to stock a wide range of XXXXXXL T-shirts and offer many different brands and styles to choose from. Whether you are after a graphic tee, something a bit cheeky or just a plain item, perfect for wearing anytime, check out our fantastic range of 6XL T-shirts. Polo shirts are one of our favourite items to wear day to day. Smart enough to look put together, great with a pair of jeans and ideal for wearing out to the pub with your mates, it’s an item you can’t really go without! 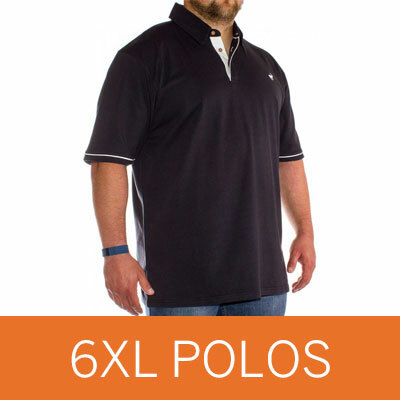 No matter your preference, Big Dude are sure to stock it – flashy and bold polos, something plain, heavily branded, a rugby polo shirt or just something with long sleeves, you name it, we stock it. Hoodies and jumpers are some of our bestselling and most popular products on the site, so we always try and ensure that they are stocked in size 6XL. If you are looking for a casual hoody, perfect for everyday wear, take a look at our warm and comfortable pullovers. We also stock more formal pieces like smart jumpers, button up cardigans and sweaters. With so many styles available including striped jumpers, large graphic prints and zipped hoodies, our 6XL choice of jumpers and hoodies is simply unbeatable. If you are in need of a 6XL jacket or coat you’re in the right place! We pride ourselves on our range and options and ensure you are covered in any weather, come rain, sleet or snow. For those wet and windy days, we have plenty of rain macs in stock; thick and warm coats for winter and lighter, more casual jackets perfect for completing any outfit. With a range of fabrics such as nylon and cotton, styles such as zipped and pullover and many different colours; find the 6XL jacket or coat you need with ease. You can’t go wrong with a pair of comfortable joggers – here at Big Dude, we live in them! Because of that, we stock a fantastic range of joggers in 6XL and cover a variety of colours and styles. Whether you prefer cuffed hems or an open leg, we have both available in all of our most popular colours including navy, grey and black. With brands including Big Dude, Baum and Kings club we have a great range of jogging bottoms, perfect for wearing around the house and lounging in or pairing with trainers and a T-shirt for a comfortable everyday outfit.